KINEIDOU Ltd. will make your item that will be your real power, it will be your strength! KINEIODU.ltd was founded in Nagai City, Yamagata Prefecture, Japan in 1948.KINEIDOU offers sports glasses and sunglasses.Then, using KINEIDOU's own fitting technology and processing technology, we select the best glasses, best fitting and vision correction, aiming for customer satisfaction from the heart.Although there are various glasses and sunglasses at present, KINEIDOU offers eyewear that can surely protect the eye irrespective of degree of freedom and degrees of freedom in sports and competition.KINEIDOU has signed contracts with Japanese professional baseball players and Japanese national players, and has received tremendous support from athletes who fight in the world.In KINEIDOU, we have accumulated data for not only selling readymade products as they are, but also with top athletes to propose optimum eyewear. Feedback it, consider the content and situation of the competition, the balance with the face, how much you can improve the performance of the frame and the lens etc, suggest the best eyewear for you by optimum tune-up and lens exchange .Also, there are things that only KINEIDOU can do, such as a fact lens using KINEIDOU's proprietary patent technology, other companies can not copy it.KINEIDOU will make a real genuine eye gear for you. 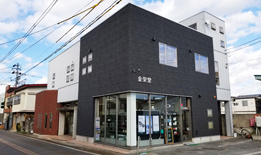 KINEIDOU develops real stores in Japan. We deal with fashion eyewear including OAKLEY and NIKE, military Wiley X and alain mikli. For details, please see the following page. 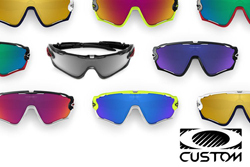 A custom eyewear program that can be ordered in any combination of OAKLEY. You can order your favorite frame color, icon color, earsock color and lens in any combination!Please see here for the detail. We accept emails 24 hours a day, 7 days a week. OAKLEY Active lifestyle new sunglasses DOUBLE EDGE in stock! OAKLEY's new active lifestyle sunglasses DOUBLE EDGE has arrived! This double edge is a model that achieves a large, wide field of view with a cylinder lens that is unmatched in any other way. The frame uses Oakley's original lightweight material Omatter, and the nose pad made of Unobtainium prevents misalignment. In addition, it fits your face in a three-point fit, making your active lifestyle more comfortable and enjoyable. And special DOUBLE EDGE finished with special color as PRIZMATIC collection. This style highlights the eyewear's presence with an original pattern inspired by the flow of raging air. The Oakley Prizmatic collection uses an unparalleled Prizm lens designed to make your viewing more enjoyable and enjoyable, making it both fun to watch and see. OAKLEY is sending out a new active lifestyle sunglasses DOUBLE EDGE sent out in spring 2019! OAKLEY×FERRARI collaboration premium sunglasses CARBON BLADE restocked! OAKLEY Carbon Blade, a new benchmark for premium eyewear, is an art object resembling an F1 machine created from ultra-lightweight titanium and carbon fiber. Specifications that HDOPolarized lenses are the standard in industrial design where art and science are fused are just proof of premium eyewear. An obtanium stem pad made of semi-rimless frame and smooth and arc-shaped lens carved out of a single piece of trick shield lens, the best material, artistic craftsmanship and complete design in world-class technology It is an eyewear fused with Then, in 1929, FERRARI is the predecessor of Scuderia Ferrari, established by Enzo Ferrari and his friends as a semi-works racing team of Alfa Romeo. Ferrari's strong position in high-performance commercial vehicles, especially in Europe and North America, is highly praised for its improved brand image and high performance and beauty of design due to its success in races including F1 2014 I made a hand with OAKLEY. The collaboration special edition of OAKLEY x FERRARI, which uses the best materials freely and combines art-like design with world-class technology, is no exaggeration to say that it is a masterpiece of supreme. After the disapproval of the number, I received many inquiries from OAKLEY and Ferrari's collaboration premium sunglasses CARBONBLADE, but after a five-year time in the spring of 2019, only a few are re-visited to Kineido We have arrived! If you miss this opportunity, it may not be the next time that you have the best sunglasses, the best materials and the best techniques. That's a very rare and premium sunglasses. OAKLEY x Ferrari special collaboration sunglasses CARBONBLADE is resale! OAKLEY Sunglasses X-METAL Collection MADMAN Asia Fit Restock! With a focus on design and function, OAKLEY has been developing technology that always beats the common sense of the industry, and releases the next-generation X-Metal series Madman Asia Fit to a limited number of dealers before and forms its unique worldview It was very well received for its excellent design and excellent comfort. A comfortable and flexible fit is achieved by combining light and elastic cast aluminum with durable OMatter. Madman, a masterpiece of industrial design that is also the essence of Oakley Design, expresses a challenging style with a profound and innovative design. It was a model that was abandoned but it was a very small number in the spring of 2019, but this Madman Asia Fit is back in stock at Kineido! It is not an exaggeration to say that it is one of the leading production technologies and designs in the industry in the field of metal frames, and OAKLEY's X-METAL has returned! The color will be Pewter / MatteBlack / BlackIridiumPolarized. If you miss this opportunity, you may not get it anymore. It is so rare, it is a gem that you can feel OAKLEY of that time! OAKLEY new combination lifestyle sunglasses FROGSKINS MIX Asia fit arrival! OAKLEY's new lifestyle sunglasses FROGKINS MIX ASIA FIT is the spring of 2019! This FROGSKINS IN MIX has been created with a fresh approach to Oakley Brand's most iconic lifestyle sunglasses FROGSKINS INS. This new FROGSKINS IN MIX with not only design but also newly improved performance function. This model, like the other FROGSKINS series, offers a new style combining ultra-lightweight, durable, comfortable O-Matter front and stainless steel stems combined with different materials. Although made of stainless steel, the stem is accented with the reprint edition FactoryPilot logo, which creates a new expression without breaking the image of FROGSKINS. The lens is made of Plutonite, which protects UVA, UVB and UVC UV rays and 100% of harmful blue light, protecting the important eyes firmly. The non-slip Unobtanium ear socks at the temple end provide a comfortable, long-lasting ride. OAKLEY will send popular model FROGSKINS series latest combination model FROGSKINSMIX ASIA FIT which spring 2019 sends out! 999'9 new collection "I will go beyond imagination" metal frame new model S-685T arrival! 999'9 new collection "I will go beyond imagination". This collection condenses the functions of past nines, further evolves it, and creates new value. The new metal frame S-685T for this "I will go beyond imagination" has arrived! This "S-685T", which is a series of S-686T introduced earlier, is a basic style with a metal front and plastic temples that anyone regardless of age or gender can feel free to hang. The front of the simple expression, the bridge, and the three-dimensional metal parts from Ji to Temple have sublimed into a design that feels the height of refined quality. We are pursuing the height of texture and functionality as a style that can be hung with a long attachment. Pursuing a comfortable ride, temples adopt elastic β titanium. A flexible environment is realized in the temple by setting the thinnest part to 0.7 mm with a press. Furthermore, by setting the thinnest point on the front side as much as possible, the reverse warp of the temple is suppressed and the shape that wraps the head is also kept. Along with functionality, we are looking for a comfortable hold. We also adopt a bridge mechanism that brings a stable front environment and metal parts with a high quality of texture everywhere. High technology is required only because it is simple, and we would like to ask for your new metal frame S-685T series of Four Nines, which has successfully embodied it!